Fox Sports: Football Week in Michigan - At Founders - Founders Brewing Co.
FOX Sports Football Week in Michigan! The football week in Michigan tour, presented by Kroger, is rolling into the taproom. 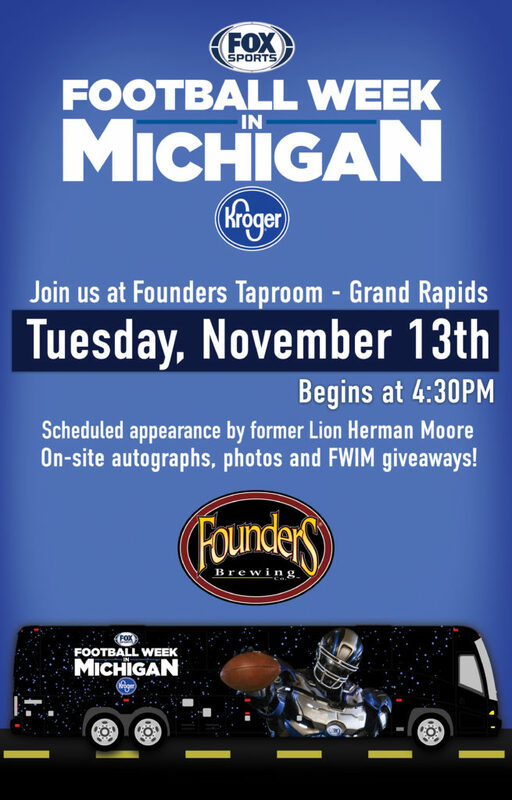 Join Fox Sports and former Detroit Lion Herman Moore on Tuesday, November 13 at Founders Taproom – Grand Rapids. There will be on-site autographs and FWIM giveaways! Additionally, Cleatus the FOX Sports robot will be on-site for photos. What better way to spend your Tuesday? !